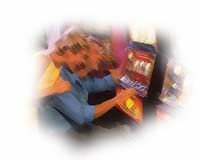 Linda was on vacation playing the slot machines. It was her first time in a casino, and she wasn't sure how the machines operated. "Excuse me," she said to a casino employee. "How does this work?" The worker showed her how to insert a bill, hit the spin button, and operate the release handle. "And where does the money come out?" she asked. He smiled and motioned to a far wall before saying, "Usually at the ATM." But those who desire to be rich fall into temptation and a snare, and into many foolish and harmful lusts which drown men in destruction and perdition (1 Timothy 6:9 NKJV). Considering the constant temptation of money, it's not surprising that Jesus had much to say about the subject. It is significant, though, that Jesus didn't talk as much about what to do with our money as he talked about the right kind of attitude we ought to have toward it. It's not surprising that Jesus had so much to say! Remove falsehood and lies far from me; Give me neither poverty nor riches. Feed me with the food allotted to me; Lest I be full and deny You, And say, "Who is the LORD?" Or lest I be poor and steal, And profane the name of my God (Proverbs 30:8-9). May you be sufficiently blessed. But, may your riches — and your desire for them — never diminish your sense of need for God. It Won't Ever Happen to Us! "Get Rich Quick?" by Alan Smith is licensed under a Creative Commons License. Heartlight encourages you to share this material with others in church bulletins, personal emails, and other non-commercial uses. Please see our Usage Guidelines for more information.